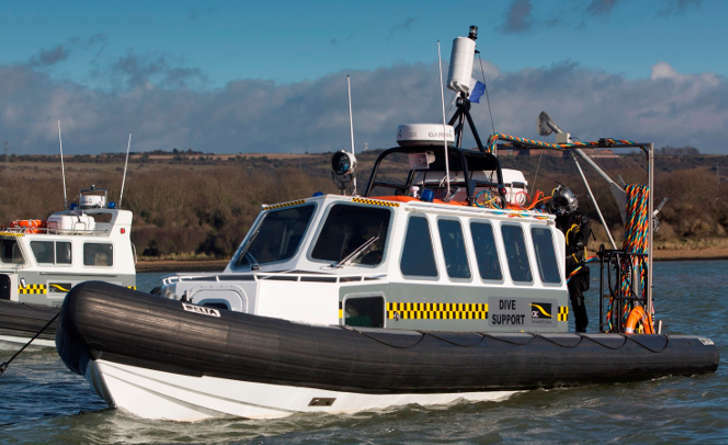 Dive Support Vessels are an integral part of any professional, offshore diving operation and Commercial Rib Charter are on hand to provide our 12m Delta cabin Rib CRC ‘Tempest‘ to assist with your project. CRC Tempest is a cost effective, fully equipped and IMCA compliant dive support vessel and can be mobilised anywhere in Europe by road or sea. Tempest is an ideal inshore support craft with a shallow draft and very good maneuverability. Click to see CRC Tempest’s full specification. CRC also have the ability to install mobile dive spreads to our other large cabin Ribs including our 15m multipurpose workboats CRC Galaxy and CRC Voyager, we can even install systems on our smaller Ribcraft 7.8m and 8.8m boats . With removable seating and an under deck matrix allowing for installation of fittings such as bottle racks and umbilical racks, the boats make ideal smaller dive platforms. ← Can Commercial Rib Charter help with a challenging survey?